POCOLA, OK (August 3rd - 4th, 2018) – The 2018 Pepsi-Cola Summertime Classic, featuring $1,000 to win, 30-lap A features for the Factory Stocks and the Out-Pace USRA B-Mods, was held at the mighty Tri-State Speedway on Friday night, August 3rd, 2018 and Saturday night, August 4th, 2018. Temps on both nights were in the mid to upper 90’s. Due to the heat, the start times were moved later in the evening. The track prep crew, yet again, did not disappoint, even with the hot temps. 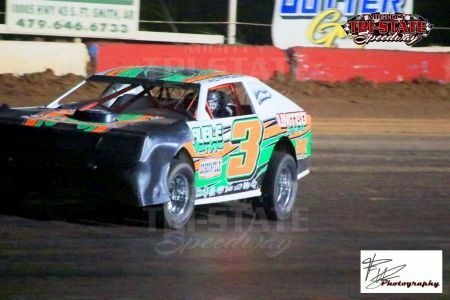 A fast, wide and smooth racing surface was provided, on both nights of racing action, with the last race on Saturday night producing 3-wide battles through-out the race. Saturday night was also the annual back to school backpack giveaway where 75 backpacks full of school supplies were given away to the kids at the track. A big thanks goes out to Angela Bourland for the hard work in procuring and stuffing the backpacks. The pre-race ceremonies started at 8:10 PM, on Friday night, with the invocation along with several cars who presented the American flag during the national anthem. Saturday night’s pre-race ceremonies started at 8:20 PM with the invocation and the top two qualifiers in each of the two big-money classes presenting the nation’s colors. Heat races were determined by the driver’s draw at sign in on both nights. 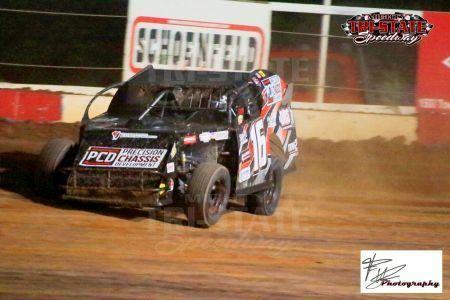 The classes advanced to their features, during this event, via passing points earned in their heat races, except for the USRA Modifieds, on Saturday night, who advanced, to their features, by our normal race procedures. At intermission, each night, everyone grabbed themselves some great food from the concessions, including the sometimes elusive TSS funnel cakes, along with an ice-cold Pepsi product. 50/50 money was given away on Saturday night while the top eight drivers, who locked into Saturday night’s A Feature, drew their starting positions by picking Pepsi cans and bottles from an ice chest. 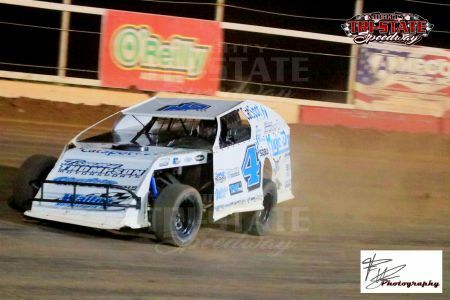 Friday night saw heat racing action for both the Factory Stocks and the Out-Pace USRA B-Mods as well as two qualifying features, for each class, that were lined up from heat race passing points. Factory Stock feature one saw Dale Richardson (327 – Muskogee, OK) take home the win over Justin Johnson (55 – Van Buren, AR) and Jacob Cox (99 – Pocola, OK). The second Factory Stock feature on Friday night, was won by Dallas Bourland (38 - Fort Smith, AR), while JR Owen (79 – Pocola, OK) and Kyle Hamby (7K – Hackett, AR) finished second and third. The top four finishing cars from each qualifying feature locked into Saturday night’s $1,000 to win 30-lap A Feature. The Out-Pace USRA B-Mod feature one saw Daniel Tarkington (2 - Checotah, OK) take home the win over Cody King (510 - Fanshawe, OK) and Hunter Byers (88B – Rogers, AR). The second Out-Pace USRA B-Mod feature, on Friday night, was won by Steve Holzkamper (5 – Gentry, AR) while Brian Williams (4$ - Fayetteville, AR) and Dean Green )28 – Siloam Springs, AR) finished second and third. The top four finishing cars from each qualifying feature locked into Saturday night’s $1,000 to win 30-lap A Feature. The first feature on Saturday night was the last chance qualifying (LCQ) feature for the Out-Pace USRA B-Mods. JR Owens (79 - Pocola, OK) took home the victory over Lonny Flanagan (7 - Rudy, AR) and Camden Perry (14C - Lincoln, AR). The next feature up was the last chance qualifying (LCQ) feature for the Factory Stocks. Wesley Bourne (5 – Cameron, OK) took home the win as Neil Johnston (27N – Fort Smith, AR) finished in second over Ron Grover (27 – Pocola, OK). The NexGen drivers, along with the Super Stocks, had the weekend off. There is still time to get racing this season with your own NexGen car. The NexGen class is an entry-level, low-cost, no racing experience class. You can find the simple rules on our website, at www.Tri-StateSpeedway.com, under Driver Info and then Rules. Blaise Leatherman (94L – Muskogee, OK) is the current points leader. After intermission, the first A Feature on the track was for the Out-Pace USRA B-Mods to see who would take home the big prop check in Victory Lane. Brian Williams (4$ - Fayetteville, AR) crossed the finish line first, after 30 laps, as Hunter Byers (88B – Rogers, AR) and Daniel Tarkington (2 – Checotah, OK) finished in second and third. Brandon Wilson (4B- Fort Smith) remains on top of the point standings with a slimmer 15-point advantage over Tarkington. The next A Feature on the track was for the USRA Modifieds where Steve Holzkamper (16 – Gentry, AR) took the win over Lonnie Robins (33 – Alma, AR) and Brent Holman (17 - Rogers, AR). George Martin (15 – Fort Smith, AR) is on top of the points by only 24 points. The last A Feature was for the 30-lap, $1000 to win Factory Stock A Feature. Dale Richardson (327 – Muskogee, OK) made the trip to Victory Lane for his photo and trophy. Justin Johnson (55 – Van Buren, AR) and Jacob Cox (99 – Pocola, OK) finished second and third. Kyle Hamby (7 – Hackett, AR) remains the point leader with a smaller 58-point advantage over second. The next event for the mighty Tri-State Speedway will be a night of point racing for all five classes on August 11th, 2018.